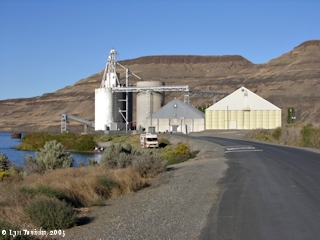 Click image to enlarge Grain elevator, Port Kelley, Washington. Image taken September 24, 2005. 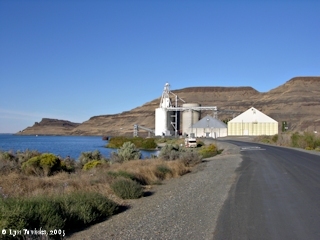 Port Kelley, Washington, and Spring Gulch Creek are located within the upstream end of the Wallula Gap, just south of the confluence of the Walla Walla River with the Columbia River. Port Kelley is at Columbia River Mile (RM) 312, and Spring Gulch is at RM 311. The Twin Sisters basalt feature is just upstream. 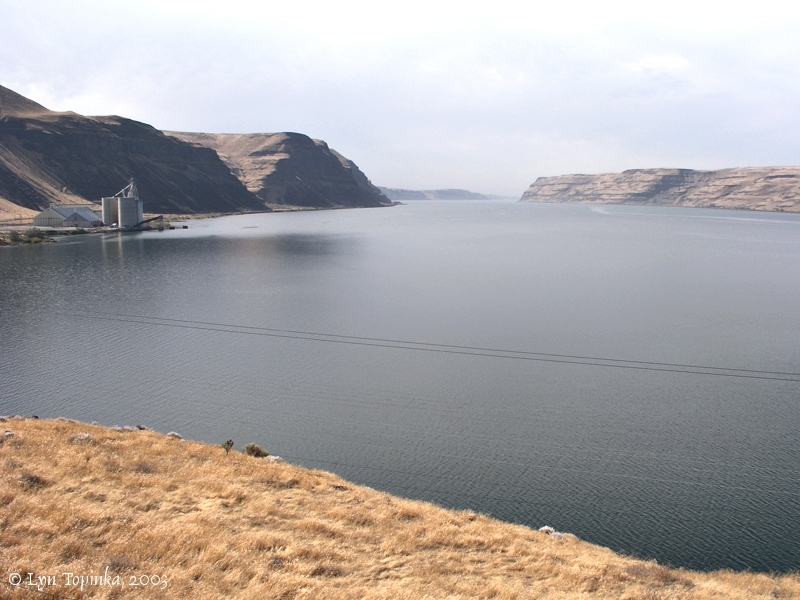 McNary Dam and Umatilla, Oregon are approximately 20 miles downstream, and Richland, Washington and the Yakima River are approximately 20 miles upstream. 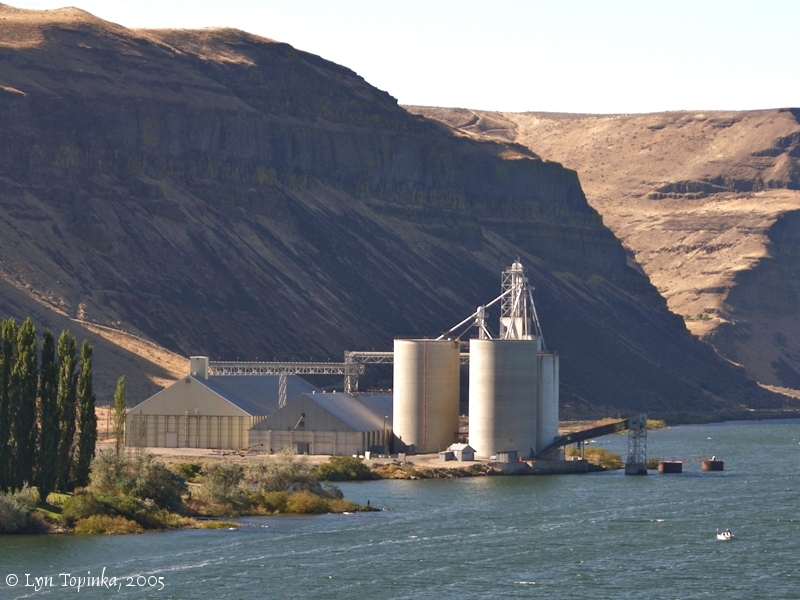 Lewis and Clark's camp of October 18, 1805 was located near Spring Gulch Creek, approximately one mile downstream of Port Kelley. The 1887 cadastral survey (tax survey) of T6N R31E shows the area of Port Kelley before Lake Wallula, the reservoir behind the McNary Dam, inundated the area. To the north of the location of today's Port Kelley is a homestead of "Thrasher". 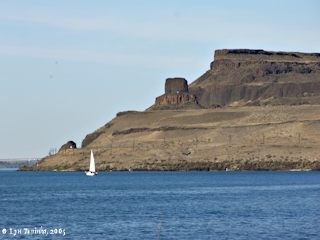 The location of today's Port Kelley has nothing, however in the middle of the Columbia is a large island called "Lasts Island", with the Last homestead located at the downstream end. The U.S. Bureau of Land Management General Land Office Records (2007) show title being granted to Hurley B. Thrasher on June 19, 1895, for 159.7 acres of T6N R31E, Section 4, under the 1862 Homestead Entry Original, and title being granted on May 9, 1896 for 107.35 acres of T6N R31E, Section 9, under the 1820 Sale-Cash Entry. There was no entry for "Last". Click image to enlarge Wallula Gap, with Port Kelley grain elevators, as seen from Sand Station Recreation Area, Oregon. Image taken September 24, 2005. Click image to enlarge Port Kelley and Spring Gulch Creek. 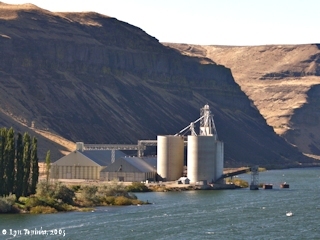 Downstream view of the Port Kelley, with Spring Gulch drainage visible (v-shape valley), as seen from Washington State Highway 730, south of Wallula Junction. 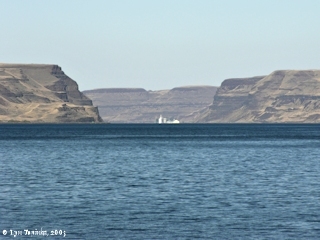 Image taken September 29, 2003. Click image to enlarge Port Kelley and Spring Gulch Creek. 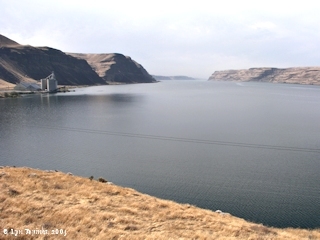 Downstream view of the Port Kelley, with Spring Gulch drainage visible (v-shape valley), as seen from Washington State Highway 730, south of Wallula Junction. Image taken September 25, 2005. Click image to enlarge Twin Sisters from, Port Kelley, Washington. Looking upstream from Port Kelley at one of the Twin Sisters. Image taken September 24, 2005. 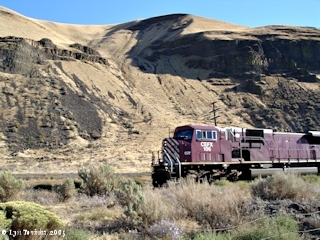 Click image to enlarge CEFX 106 passing through Wallula Gap at Port Kelley. Image taken September 24, 2005.